No single diamond is the same. Each stone is a miracle of time, heat and seismic movements! This is why over time specific qualities in diamonds have been used to establish their value. Until the 1930s, there was no agreed-upon standard by which diamonds could be judged. Today, however, the 4 Cs of diamond quality is the universal method for assessing the quality of any diamond. So…where did the 4 Cs come from? A former jeweller, Robert Shipley, was fiercely committed to making the American jewellery industry more professional. He established an institute (the GIA) to provide jewellers with formal training and was obsessed with knowledge and standards when it came to buying and selling gems. Shipley developed the 4 Cs as a mnemonic device to help his students remember the four factors that characterise a diamond: colour, clarity, cut and carat weight. The concept was simple but revolutionary! The 4 Cs of a diamond will strongly inform its price and with the right combination, you will be able to find the perfect diamond within your budget. This blog will break down each characteristic for you and help you to understand their importance from a diamond dealers point of view. When looking to buy a diamond the most simple place to start is with the carat weight. Diamond carat is often misunderstood and refers to a diamond’s weight, not its millimetre size. A metric “carat” is defined as 200 milligrams (1 fifth of a gram). When comparing diamond carat sizes, make sure you look at its millimetre size as well. A diamond with a higher carat weight but a poor cut grade may actually look smaller than a diamond with smaller carat weight and a better cut. This is because it is cut deeper, that is, more carat weight is held underneath the stone, often this has the effect of making the stone lack sparkle. Equally, a diamond which is too large for its carat weight (i.e. a thinner diamond) will lack the beauty of a better cut diamond, and will often have a blackish look about it. Diamond price increases with carat weight because larger diamonds are rarer and more desirable. However, two diamonds of equal carat weight can have very different values depending on the three other factors of the 4 Cs: Clarity, Colour, and Cut. Diamond colour is arguably the most important characteristic to consider when choosing a diamond. Unlike clarity, colour is something you can see with the naked eye and without a loupe (this is what diamond dealers use to look at diamonds, it has the power of 10x magnification). While brilliance (sparkle!) is the first thing you notice about a diamond, colour is the second. The higher the colour grade, the less colour there is, and the more expensive it will be. As you can imagine, top colour diamonds command a premium, but they are truly beautiful stones! There are five categories on the GIA diamond chart, with colour grades that range from absolutely colourless to light in colour. The colour chart starts at D and runs alphabetically all the way down to Z. Diamonds graded D, E and F are the most considered devoid of colour and are very rare. They are classed as “colourless” and are within the first of the GIA’s six categories of diamond colour. G-I colour diamonds are near colourless with slightly more noticeable light-yellow hues and are therefore priced lower, however, they are still considered a decent colour within the industry. So, when is colour a good thing? When it refers to the rainbow spectrum of colours – red, orange, yellow, green, blue, pink, purple, and more. These are known as coloured diamonds and are graded on a separate diamond colour scale. Coloured diamonds of equivalent cut and clarity are almost always significantly more expensive as only one in every 10,000 diamonds possess natural colour! As you would expect, the more intense the colour, the rarer and more valuable the coloured diamond. Natural diamonds are formed as the result of carbon exposed to tremendous heat and pressure deep within the earth. This process can result in a variety of internal characteristics called inclusions and external characteristics called blemishes. Clarity refers to the degree to which these imperfections are present within the diamond. The position of an inclusion and its relief (how visible its colour is against the background colour of the diamond) affects how easily it can be seen. Diamond cutters make every effort to cut a stone so that inclusions are not visible to the naked eye, and if that is unavoidable, then at least not visible through the table (the largest central facet on the top of the stone). Within each category are two levels, that is, a diamond graded as Vs1 is higher in clarity (i.e. the marks will be less noticeable) than one which is graded Vs2, it will, therefore, command a higher price. While no diamond is perfectly pure, the closer it comes, the higher it’s value. The key point to note here is that diamonds with VVs, Vs and Si inclusions should not be visible to the naked eye. In certain cultures, like India, inclusions are seen as bad luck and wearing a flawed diamond would bring the owner misfortune. However, in the UK the preference is for stones with moderate inclusions (VS and SI stones) as they are better value for money and the inclusions cannot be seen without 10x magnification in any case! 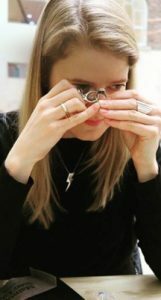 The key is to ensure you are buying your diamond from someone you trust to guide you through your diamond inclusions so that you can make an informed choice! The GIA grades the cut on round brilliant diamonds from Excellent to Poor. However, the cut grade on the certificate doesn’t always reflect the beauty of the stone. Some “old cut” diamonds (i.e. diamonds cut in the Victorian era) won’t have the best cut grade on paper but often they have the most beautiful sparkle. Equally, a modern brilliant with an “excellent” cut grade, can look horrible if, for example, it’s “milky” (when a stone has a cloudy hue). The key is to make sure that you buy your diamonds from a reputable and experienced dealer as they will be able to advise you on these factors. This is especially important when it comes to fancy shapes (i.e. diamonds which are not round) because fancy shape diamonds are actually not given a cut grade by the GIA! It is considered very subjective as to what is the perfect cut on, for example, an oval or a pear shape. Your diamond dealer will be able to advise you if any particular proportions of a fancy shape are better in terms of light reflection than others. Many people ask us which is the “best” shape of a diamond to choose. There is no right answer here, it is entirely personal preference. The round brilliant diamond is, however, the most popular, and for every 10 diamonds we sell, 9 will be round brilliants. The “perfect” diamond would be cut to return the greatest amount of light, colourless, and flawless (no blemishes or inclusions), such diamonds are rare, and are generally extremely expensive. However, that does not mean you cannot find a diamond of excellent quality if you just pay attention to the 4 Cs. Make sure to use your new knowledge on the 4 Cs alongside the help of a reputable diamond dealer to find the right diamond to suit your personal preference. Now that you have learnt the importance of the 4 Cs, don’t forget to make sure you are utilising the fifth C… Celsteel! 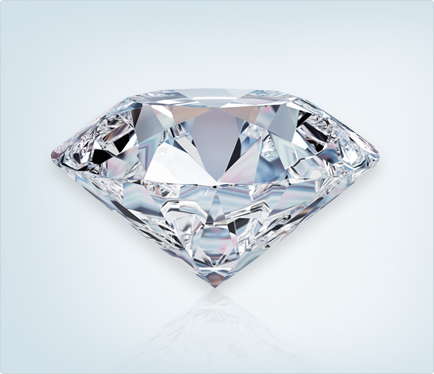 We’re dedicated to ensuring that you really do get the best value diamond for your money. If you would like more advice on the 4 Cs, please feel free to call us on 020 7831 8504, we’d be happy to answer any questions you may have!